How do artists get their ideas and inspirations? A concept can come from almost anywhere. A comment overheard on the subway, a line of text in a blog, a picture or painting one sees by chance. 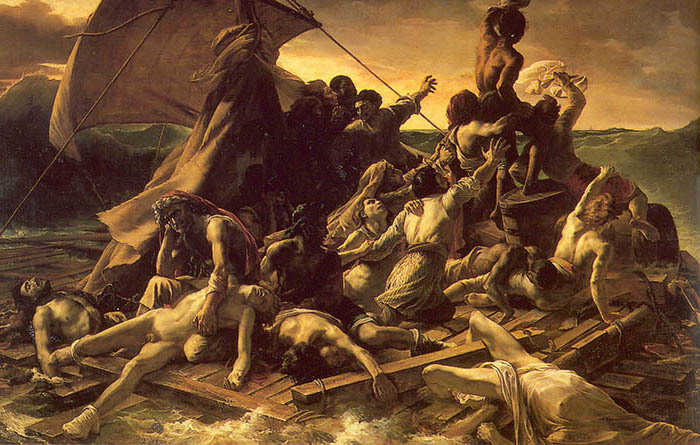 An artist friend, Dee Connors, showed me a photo of "Raft of the Medusa" by Gericault. The image overwhelmed me. I wanted to do a painting based on it. 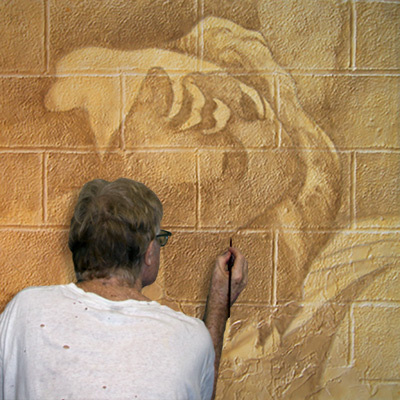 Below are the various stages of the painting. If you scritinize Gericault's painting, you can see the face I chose to paint in the lower middle/left. I enlarged it as much as I could in Photoshop, but the working photo was too pixilated. I probably didn't get too close to the original. This is fine, because I wanted to make it my own anyway. I did not paint a dead person. I painted the moment of transition, when one leaves the past and embarks on a new beginning. A new career. Relationship. Home. I painted the moment of rebirth, the beginning of fresh opportunities and new adventures. To reach our fullest potential, we have to let something go and be brave enough to take new paths. A death, yes, but with the promise of personal growth. I know I have my doubters, those who do not believe I actually paint my images. Let me assure you, I do. This page will shed some light on my secret techniques. The first step is to block in the figure and the shapes of the concrete blocks. I used thin acrylic paint in a watercolor consistency. All major decisions about placement are made in this stage. It is important for the mortar lines not to interfere with an important features of the man's face. Using light umber and yellow ocher, I painted the highlights and shadows. I was not concerned with details yet. The painting is 40 x 40 inches and is painted on silk charmeuse. I use silk because there is not texture to the fabric to interfer with the illusion of cement. Confident that everything is where it's supposed to be, I began to refine the details with thin layers of paint. I sculpt the lips, nose, chin, eyes, and of course the cement block. 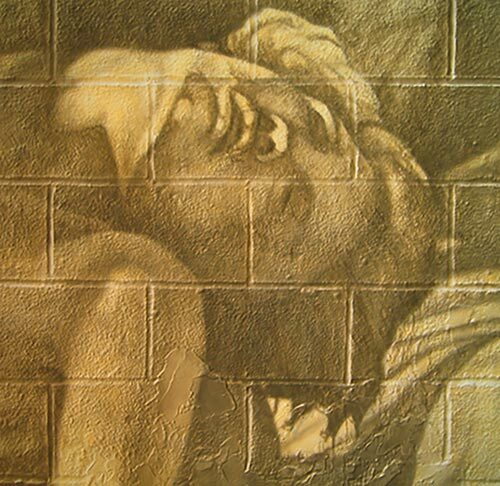 Both the skin texture and cement texture must be done concurrently. There is always a push and pull to keep the balance equal. I introduce colors like burnt sienna, which will glow through the subsequent layers of paint. I delineated the eyes for proper shape and placement. To add interest in the concrete block texture, I introduce a bit of stucco in the lower part of the painting. I have to commit to this from the first layer, or it'll give me problems later. By now I'm feeling good about the piece. All the problems are resolved (one trick is to look at the painting in a mirror. The reversed image shows any flaw in the design.) Each layer of paint adds richness. 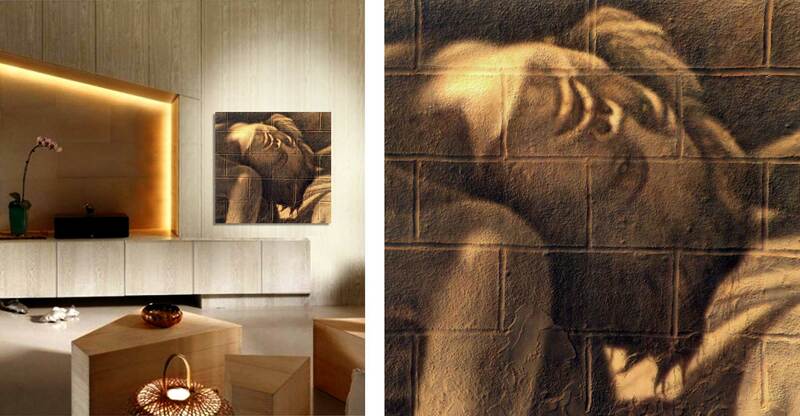 As the shadows deepen (to both the figure and the concrete block), textures become accentuated and the drama reveals itself. The drudgery is over and the fun begins. Voila! The grand unveiling. And then the doubts begin. Did I go too far? (One of the hardest aspects of painting is knowing when to stop!) Did I lose too much of the concrete block? Did it get too dark? There is always a moment when the painting looks good, but you think that with one more push, it can be great. "Do I risk everything and take it one more step?" Every artist has to struggle with that question. Sometimes you lose a piece because it went too far. But it is very important to be willing to take that risk. If you're reading this sentance, hopefully you've learned a lot about how I create my artwork. I welcome your questions, comments, (but please, no complaints!) Much love. I did not paint a dead person. I painted the moment of transition, when one leaves the past and embarks on a new beginning. A new career. Relationship. Home. I painted the moment of rebirth, the beginning of fresh opportunities and new adventures. To reach our fullest potential, we have to let something go and be brave enough to take new paths. A death, yes, with the promise of personal growth.